SSC Phase VI Recruitment 2018: Applications are invited from eligible candidates for the various Selection Posts by the Staff Selection Commission under Phase VI Recruitment. 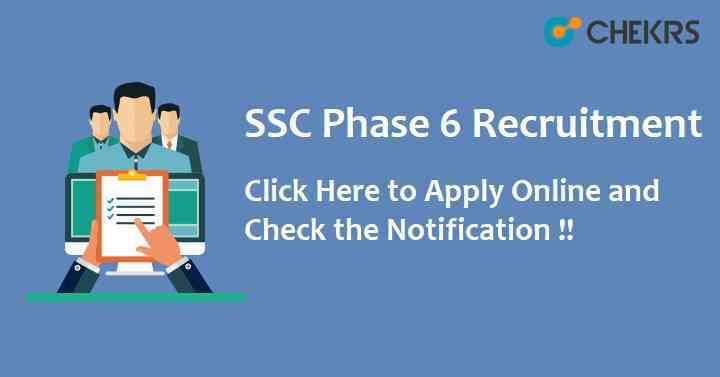 Candidates should go through the SSC Phase 6 Recruitment 2018 Notification carefully before applying for the post and ensure that they fulfill all the necessary eligibility conditions. Candidates will have to apply for each category of post separately under the existing Government Jobs and also pay fee for each category. Take the help of the guidelines stated below to apply for the SSC Phase 6 Vacancy. Click on the Apply link available on the home page of the website. Now, register yourself there for the vacancies. Then login with the registered id and password. Fill up the SSC Phase VI Exam Online Form 2018. Remarks: You can comment us in case of any query regarding the SSC Phase VI Recruitment 2018. We will try to solve them as soon as possible. Resgistation is done but not show the registrtaion number why? IS THIS FOR DEPARTMENTAL CANDIDATE OR ANY ONE APLLY FOR THIS.